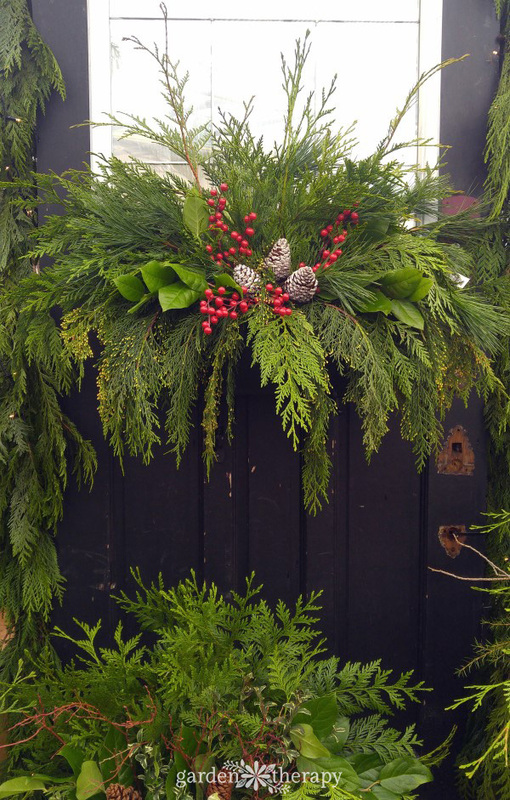 Get ready to amp up your holiday planters with a quick and easy DIY. These festive planter ornaments can be found for big bucks in garden centers and floral shops or you can make them virtually for free at home. 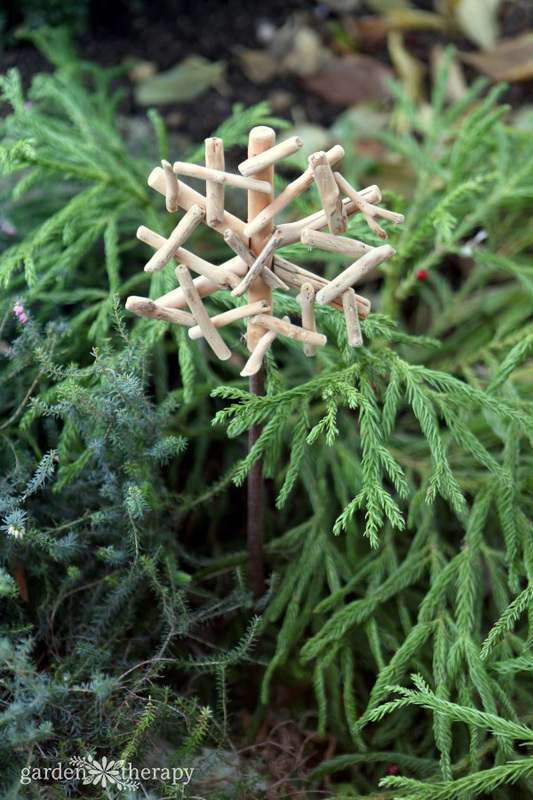 Look for some found items around the garden, a few branches, and some glue, and let’s get creative! I probably visit garden centers more in the fall than any other time of year. 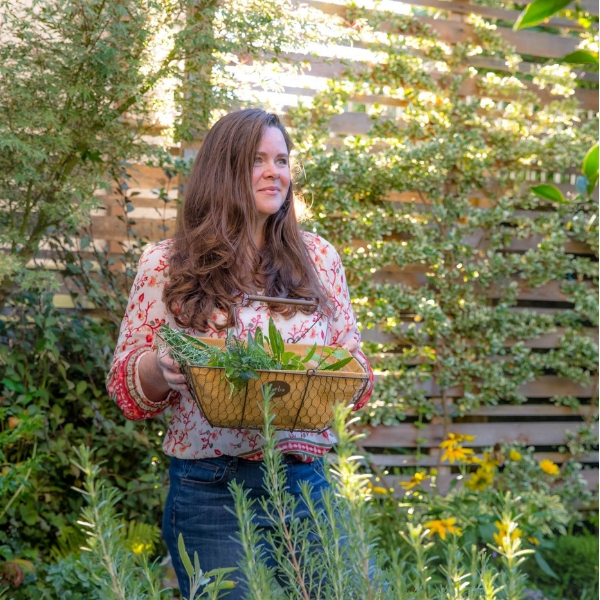 If you want to save some money on your garden projects, fall is the time to shop for perennials, shrubs, and trees. 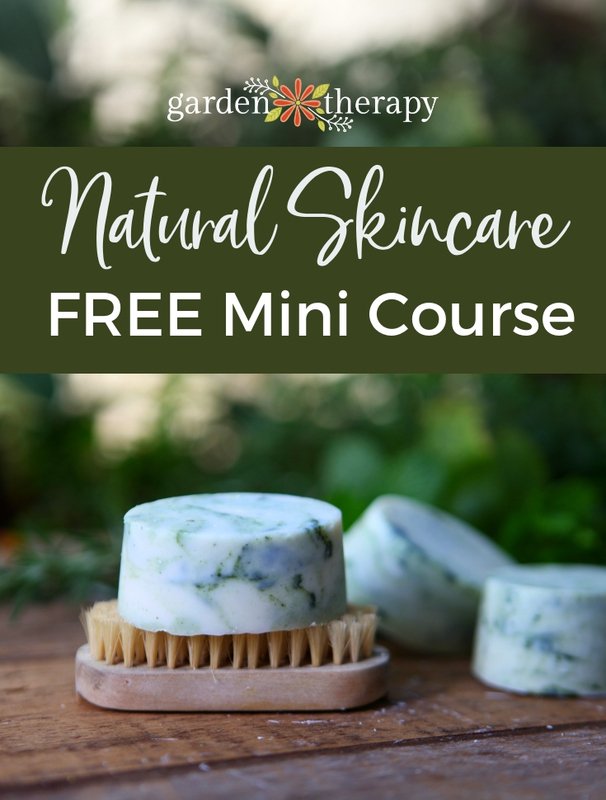 You can read about frugal garden planning more in this post. When you get to the garden center to shop for deals in the fall, they have without fail started to truck in the holiday decorations. It’s an absolute feast for the eyes! If you haven’t done your holiday decor shopping at a garden center, go now! Just bookmark this page and come back when you are done. You will see sections of the shop dressed to the treetops in stunning holiday decorations in a variety of styles and themes. It’s a lovely way to get into the holiday spirit as well. Once you have inadvertently loaded up your basket with treasures, you may have to make some hard decisions. As much as I wish I could have all the things, I’m fairly modest in both spending and in space to store it all. I add one new decoration each year to the indoors, and it’s usually something that is handcrafted. This year, I want to take my winter containers up a notch and planter ornaments are just the thing to add a little extra pizzazz. They are the jewelry to your holiday dress! And the best part is that they couldn’t be easier to make. Here are a few photos of some of the lovely ornaments that were for sale at my local garden center. 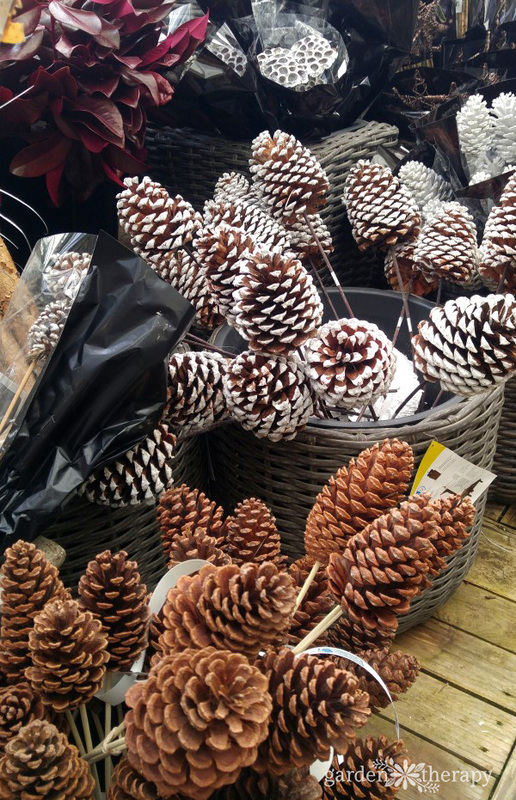 I just loved the wood slices and pine cones, but $12.99 each? Oy! Now, please don’t get me wrong, I do support the garden center. I spend hundreds of dollars a month at small, independently owned garden centers so I don’t feel bad when I leave one thing out of my basket and rush home to craft it myself. And these are so darn simple that I couldn’t resist! Hunt the garden for straight-cut branches at least ¼” in diameter. If the branch is not a particularly strong wood, then move up to ½” diameter branches for stability. Some older branches may break too easily at ¼”. Now, decide what your ornaments will be. 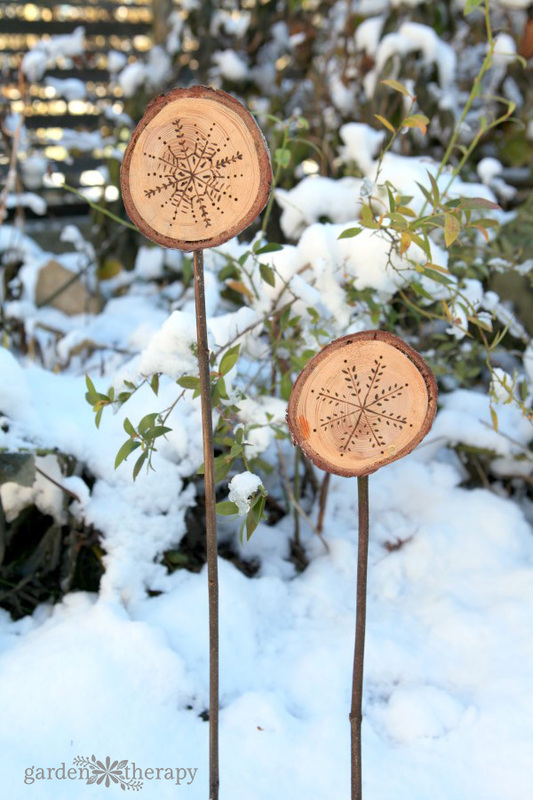 I chose to make some pyrography wood slices with snowflakes like the ones I saw at the garden center. 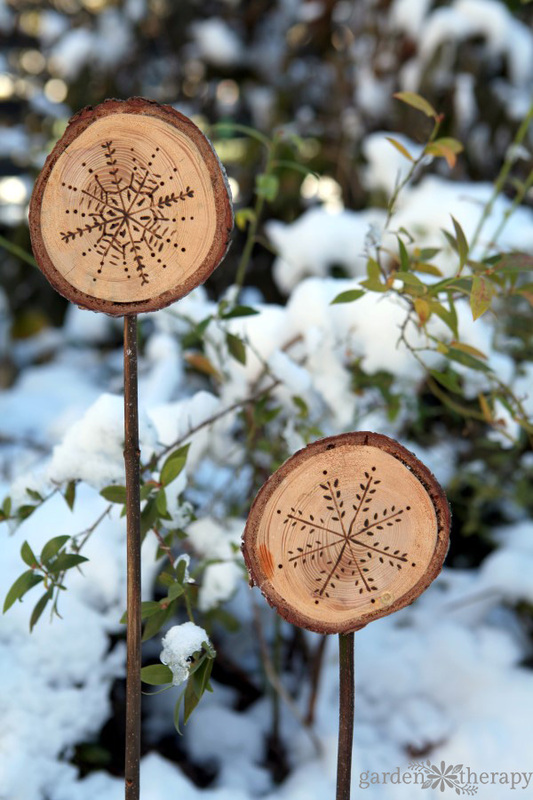 See how to make wood-burned ornaments here. 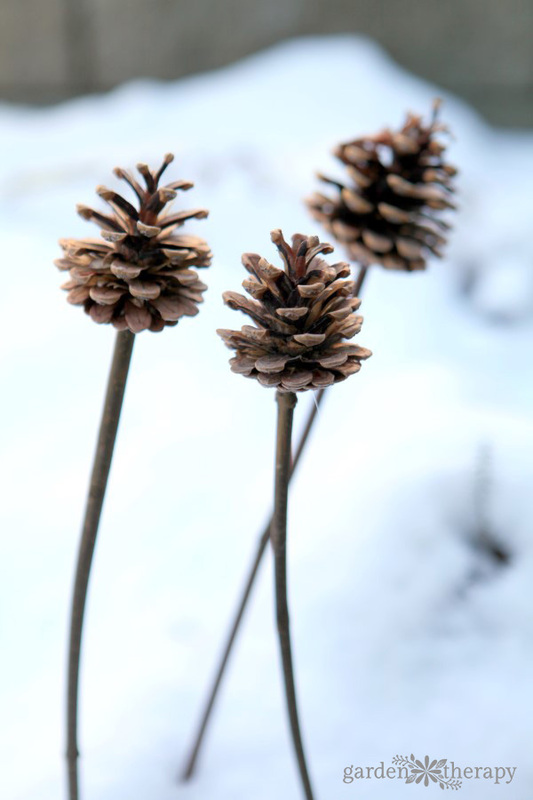 I also chose some pine cones. 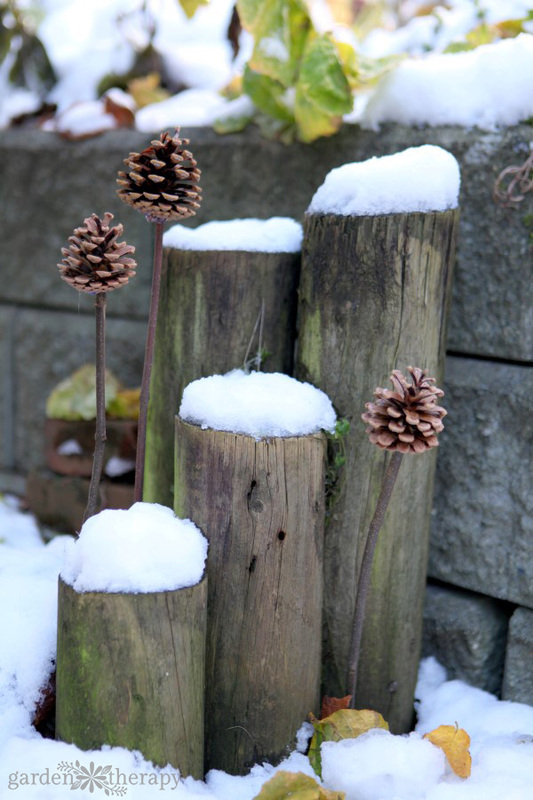 The thing to note with pine cones being used outdoors, especially if you are in a rainy climate like I am, is that you will need to let them fully dry and open first, then spray them with a weather-resistant sealer. I like spray Varathane as it doesn’t get them so wet that they close up again. 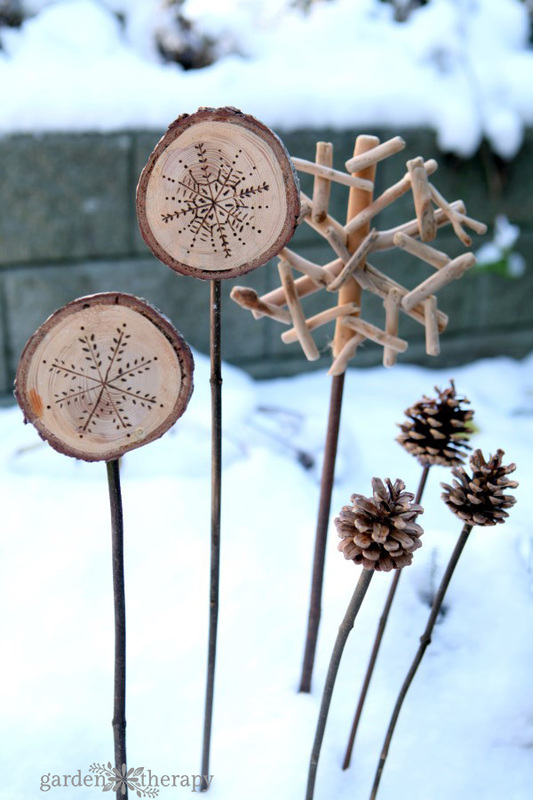 You could also look for inexpensive wooden Christmas ornaments to turn into planter decorations. I found some driftwood snowflakes that look perfect. Wood ornaments can also be sprayed with Varathane to preserve them through the season. 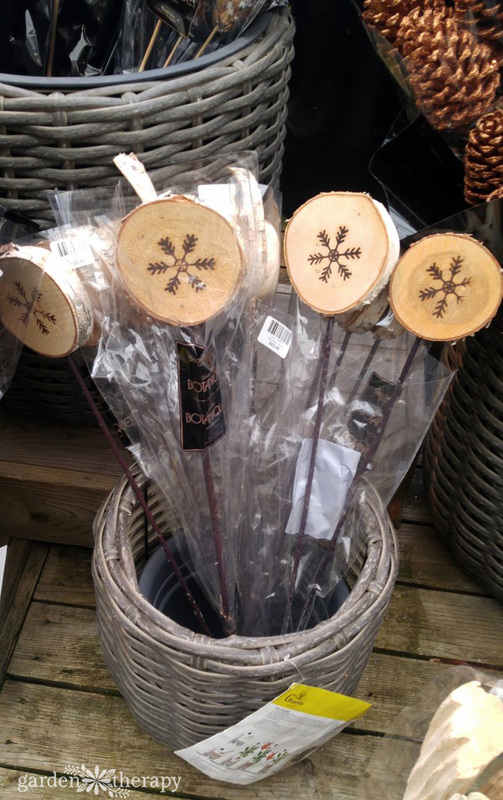 Attach the ornaments to the sticks with outdoor waterproof wood glue. Trust me, don’t just grab the hot glue gun and hope they will hold. Even with pro-strength hot glue sticks, they will fall apart in a week if it rains. 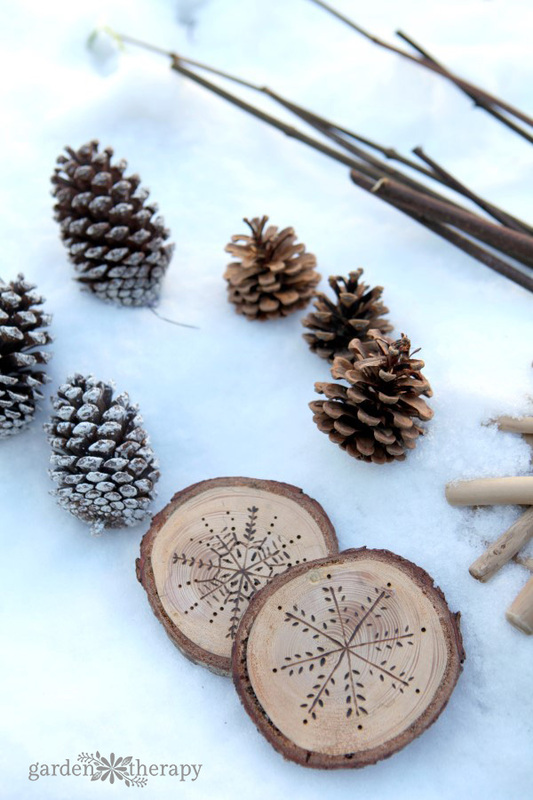 If you are in a warm, dry climate, then you can skip a lot of these steps and just hot glue the ornaments to the sticks. I live in a rainforest where everything is wet for the winter months. My ornaments are subjected to the worst of it and make it through (even snow and wind would be less damaging to these ornaments), so if they can last in Vancouver, they can last in your area too! 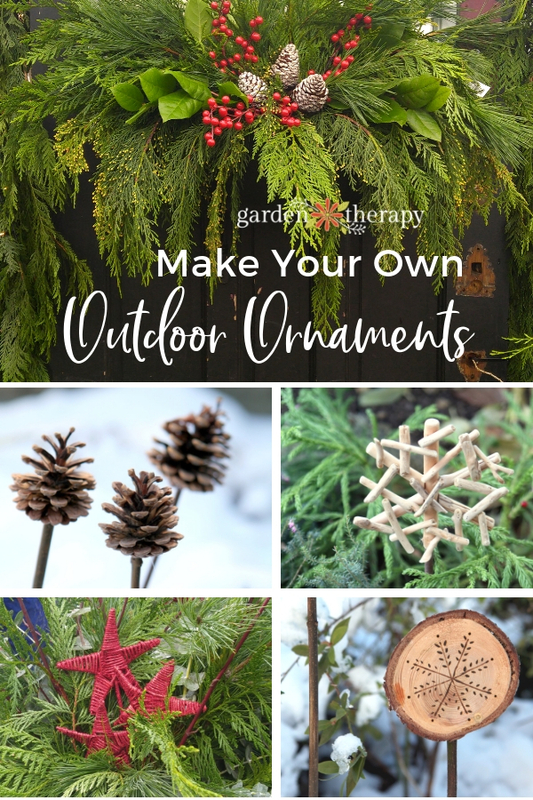 Once the glue and varnish are dry, move the ornaments outdoors to decorate window boxes, planters, and even just the garden. Hi Stephanie…love your plans for the wood slices! Do you have plans for those beautiful wrapped stars? Hi Dawn, Thank you!! The stars are Christmas ornaments glued to sticks and painted red. I’m sure you could find something similar or use any other star ornament that is water resistant.